The New Mexico Foundation for Human Rights Projects began its work in 1989, with major projects beginning in 1993. Exhibits, speakers, workshops, and other activities involving teachers, students, and the general public have been hallmarks of our organization. The goal of NMFHRP is to provide teachers and students with the tools to combat the hate, prejudice, and racism prevalent in our society and around the world. Education is the key. Getting to know people of other cultures, ethnicities, races, and religions is the first step toward defeating ignorance. We use the Holocaust as a springboard to the present and the future. The lessons of the Holocaust resonate in today's world--there are still people who are victims, perpetrators, collaborators, and bystanders. This site will provide a means of keeping in touch with the foundation's work. Hopefully, viewers will find information that will be useful in the classroom or in life. 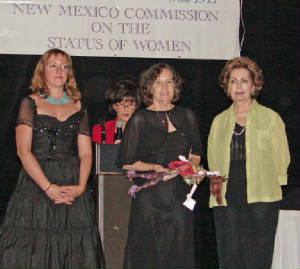 Regina Turner, Executive Director of NMFHRP, was a recipient of the 2006 Governor's Award for New Mexico Women. Nominated by NMFHRP volunteers, Regina was one of 20 women out of 130 nominees chosen for the award. Many teachers, admini- strators, and NMFHRP partners wrote endorsements submitted with her nomination. The introduction to her nomination packet read: "Regina Turner, Executive Director of the New Mexico Foundation for Human Rights Projects (NMFHRP), has been a community leader and advocate for education, giving New Mexico teachers and students tools to combat racism, prejudice, intolerance, and bullying. Working for positive change for women and families, she has empowered students to make choices that will allow them to create and be part of a more respectful, tolerant society. For her dedicated contributions and achievements, which have so positively impacted tens of thousands of students and hundreds of teachers, Regina Turner deserves the Governor's Award for Outstanding New Mexico Women." Winners were honored at a dinner on May 5, 2006, at the Hotel Albuquerque. 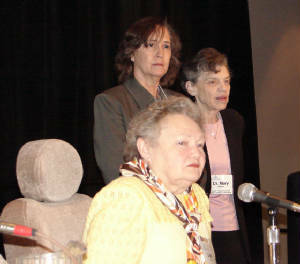 More than 700 New Mexico students heard the stories of six Holocaust survivors residing in Albuquerque on this Day of Remembrance, April 25, 2006, at the Albuquerque Convention Center. NMFHRP Executive Director Regina Turner introduced the program; a proclamation from the City of Albuquerque declared an official Holocaust Remembrance Day; and Dr. Mary Johnson, Senior Program Associate of Facing History and Ourselves, presented opening remarks. Following the survivors' presentations, students engaged the speakers in a question and answer session. upon the altar of insantity. and trace the eclipse of humanity. . .
. . .has yet to learn why.